Pray that many Americans will understand and demand that our government be restored to the separation of powers clearly laid out in the Constitution. Watch this video and share with others. Pray for our government! I am praising God for and claiming His power to work mightily through a righteous remnant in bringing revival and deliverance to our land in desperate times! And here I was so disturbed for our young people running the world after their anti-American, pro socialism, indoctrination in our secular universities. This young man renewed my hope. God will have His way and it is wonderful to see someone seeking to be on the samepage! Amen! to all Scripture backing your comment. We need to stick to the Word in prayer not to our own agenda. Finally, a congressman who is not afraid to speak out the truth. Now, the question is, will the rest of Congress and representatives, humbly receive it. Outstandingly job!!! He has it RIGHT!!! 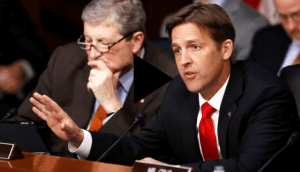 Bravo Senator Sasse! This needs to be played in ALL schools. We must get our government back on track, greatly reduced and directly answerable to we the people.